"Rejection is not an indication that you were not chosen, it's a sign that the person who rejected you feels threatened by your presence." I have had many experiences in my life with rejection that I can write an entire book on the subject matter. But each time, I learn a lesson that is different from the one before. Something new about me is always revealed. I understand that the more I am navigated into my purpose and the closer that I get to that goal, the more rejection that I would encounter. Not necessarily from strangers, or even the enemy, but often times it's from the persons that are closest to you. Today however, suffering from rejection, it feels really different. I no longer need to feel ashamed or to feel inadequate as though something is wrong with me - that I am perhaps any less gifted than the person at whose hands I suffered the rejection. Rejection reveals your purpose. It helps you to see how God purposely chose you in spite of what you have suffered. It causes you to draw strength and courage from the well of mercy, grace and the favor of God in your life. As you step into this new realm, and the new chapter of your life, know that God is with you, He will never leave you nor forsake you. Greater is he that is within you, than he that is in the world. Rejected by others, but the accepted and the beloved of God. I fully agree that the person who has rejected someone feels threatened by that person's presence. Living with rejection is not easy, but God said we are more than conquerors through Christ who loves us. Therefore we, all those who know God and have been rejected by someone, have what it takes to rise above the spirit of rejection, all we need to do is activate it and soar high like the eagle. Good post. Hi Ava, I absolutely love that word that says we are more than conquerors through Christ who love us. Good encouragement! Blessings! I love this quote, I had to pin it for sure! 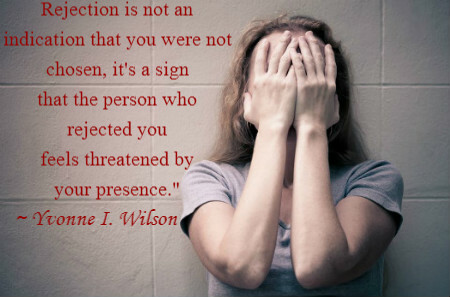 It's so true, the person who is doing the rejection does feel threatened, and there is no need for the rejected to feel bad about the reason, it just reveals something greater within ourselves. Hi Kalley, happy that you love the quote. Thanks for re-sharing with others. God bless you!